How do you play Altered Conduct? What does one do in this game? Altered Conduct is a three-dimensional bird’s eye view strategy game that will challenge players to solve intricate and high stakes environmental puzzles through the use of a series of special abilities determined by the roll of a set of dice. One set contains three standard six sided dice, which give access to three distinct categories of abilities. Upon rolling this set of dice, the player will gain access to three random abilities from the different categories, namely Teleport, Flux, and Morph. For example, could roll Morph, Morph, Flux or get Teleport on all three dice. The player will then be able to manipulate the results from the roll and change at least one die, thus enabling them to strategise their way around the level more efficiently. These mechanics challenge the player to incorporate elements of chance into their solutions and to think of creative ways to solve the puzzles regardless of where the dice land. The three distinct categories of mechanics each contain three possible actions within that category, amounting to a total of nine separate mechanics in the player’s arsenal. Each of the categories and actions will be described in more detail shortly. It is in the player’s interest to solve the level with as few rolls as possible, even though they typically have an unlimited number of times they can roll their dice,. In the universe, the more Zeta uses her dice, with all of those amazing abilities that no one else can use like her, the more noticeable she would become. These powers are rather dynamic and the more she uses them, the more enemies would notice her. The people in that universe would have never seen anyone who could use multiple powers at will, which is why Zeta would become memorable to them. Therefore, mechanically speaking, enemies’ range of detection would be increased each time the player rolls the three dice, making the level increasingly difficult to solve. Naturally, the level design would account for this limitation as well, ensuring that each level can be solved with the change of one ability only. Ideally, most levels would be optimally completed with one to three rolls of the set of dice. As this game is a highly strategic experience, it features a turn-based system that allows players to complete two actions per turn. These actions can be either movements or abilities. A movement is considered to be any sort of relocation from one point to another within a certain range, while an ability is considered to be the use of any of the available special powers. Rolling the dice and changing how the dice rolled are not considered separate actions and would not be counted under this system. What’s more is that players will be able to prepare the abilities they would like to use at any time, however, they would only be able to execute them on their turn. Additionally, players will have the option to elect not to take any actions or make any movements during their turn. Once the player has completed their two actions, all enemies will have the opportunity to do the same. It should be noted that Altered Conduct will be rather challenging, because the game will have a one-hit system. If Zeta takes a direct hit from an enemy in any capacity, she will be captured, and the player will have to restart the level. Similarly, if Zeta directly hits one or more enemies once, those enemies will be disabled, allowing for safe passage. The turn-based system and the one-hit system are both based on the Paper Prototype as those mechanics seemed very efficient in that version of the game. Both movement and any sort of actions will be handled through a node-based system, which means that both players and enemies will only be able to move onto certain nodes. The pattern the nodes form will not necessarily be that of tessellated square tiles, but would rather be adapted in accordance with the needs of the level. The range of any abilities will also be determined by an established number of nodes it can affect. The exact values will be calculated later on in the development process. What’s more is that if players position themselves on a node that’s directly behind an object, then the player will automatically crouch behind that object to hide. In terms of UI/UX, this node-based system will be rather discreet and would feel intuitive and diegetic within the environment. 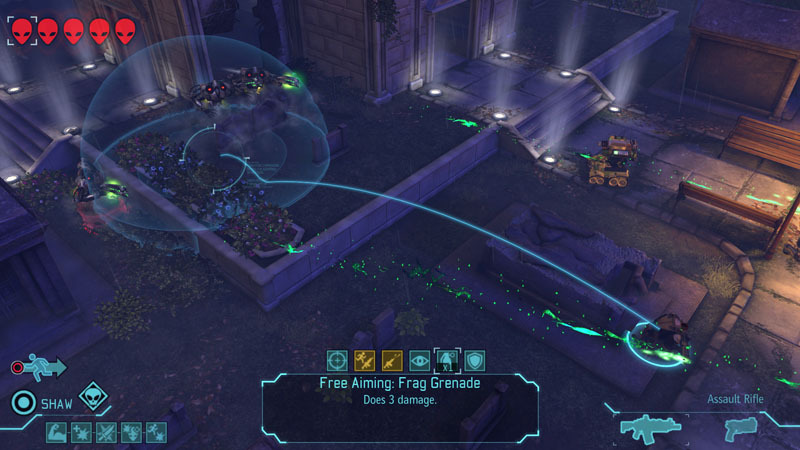 A good example of the type of node system Altered Conduct may feature can be seen in Lara Croft Go, Deus Ex Go, and in XCOM: Enemy Within (displayed below). The node-based system will allow players to make accurate assessments of their own abilities and will help them anticipate the movement of their enemies. It is a very clear way to analyse one’s surroundings and to predict how separate elements will behave, which is key to any strategy game. All abilities and actions must follow established expectations and a node-based system will aid in achieving that goal. 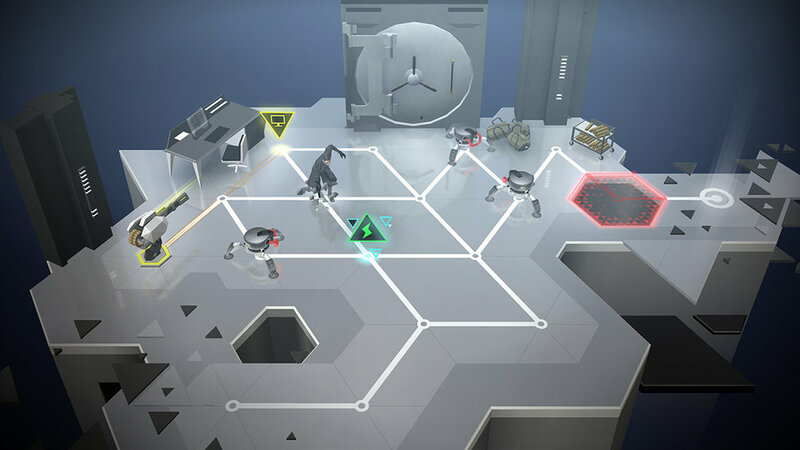 In addition to the chess-like, bird’s eye view gameplay, which is the main part of the game involving avoiding enemies and completing missions successfully, the game will also feature camera-shifted narrative puzzles. These sections of the game will shift the camera to a more cinematic angle for the purposes of storytelling and will provide the player with limited interaction, for example, picking up objects or movement. The narrative scenes will be rather brief, however, they will vary the gameplay and provide context for what the player is doing in the universe. Examples of similar storytelling are featured in Detroit: Become Human, The Walking Dead, Life Is Strange, and more. Alternatively, I have also considered featuring brief and highly stylised cut-scenes such as in Dishonored 2, however, I would rather have some sort of puzzle or interaction throughout all parts of the game. Ultimately, the specific methodology for conveying the narrative elements of Altered Conduct will be determined after a user testing session, where players will be able to give feedback on the efficacy of both options. The gameplay and mechanics of Altered Conduct have gone through a series of iterations and redesign sessions. To review those, please refer to Week 5: Just for Fun, Week 7: Project Proposal 4, Week 8: Prototyping Camera and Movement in Unity, Week 8: Prototyping Abilities in Unity, Week 9: Paper Prototype, and Week 9: Environment and Lighting in Unity. How does one win in Altered Conduct? A player can be considered to have won a level if they have successfully completed the level’s objective without getting captured. As there is no health bar in the game and even one strategic mistake equates to failure, the stakes are rather high and players must be cautious of how they use each of their abilities. Creative and well-thought through strategic decisions are what will win players each level. It should be noted that there would be a multitude of solutions to the levels, and all puzzles will be designed with the element of chance from the dice in mind. Altered Conduct will likely have a series of different objectives for separate levels. Some may be as simple as getting from Point A to Point B without being captured, while others may include limitations such as solving the level within a certain time frame, or within a certain number of actions. Some may require Zeta to retrieve specific objects from a target location or to rescue friendly NPCs. The specific objectives of each level will be determined at a later date and will follow the overarching narrative of Altered Conduct. Aside from completing each individual level players could also be considered to have won once they have progressed through the full narrative of the game. Each individual level will have its own purpose and objectives in accordance with the story, so Zeta will never be going through these challenges for the sake of them. The level objectives discussed above will also be largely based on the narrative and will be designed to make sense in accordance with the game universe and the events going on in it. Thus far, the overall gameplay, strategy, win conditions, key systems and the rules of Altered Conduct have been discussed in detail and have hopefully provided a good idea of how this game will function. At this stage, it is time to describe the specifics of the special abilities Zeta will have access to. Additionally, I have also provided the current design of the UI system, as it is important to understand how players will activate and engage with all of the separate mechanics. I would also like to take this opportunity to reiterate that Altered Conduct is not a violent game, and only one ability is directly hostile towards enemies, rendering them unconscious. Action 1: Teleport the player to a target location instantaneously within a certain range. This is the most basic use of Teleportation and would be used for mobility. Action 2: Teleport a non-playable character or predetermined significant object to a desired location within a certain range. Significant Objects may include things like keys or dedicated mission items, depending on the puzzle and level design. Action 3: Swap places with another non-playable character. This will instantly alert that NPC of what has happened and of your location. It’s important to note that much like in board games, Zeta will only be able to use her Teleportation if she has line of sight of her target. This means that it would be impossible for players to transport themselves past walls and other such environmental obstacles. Action 1: Focused Beam - The Focused Beam has multiple applications, the most significant of which is that it allows players to target enemies. The player can select an enemy within range and stun them with an electric bolt, much like a taser gun would. If there is another enemy within a predetermined range of the first target, then the second enemy will also be stunned. In addition to targeting enemies, the Focused Beam can be directed at specific objects in the environment such as Electromagnetic Doors (to be opened or closed depending on their starting state). Another object that could be affected would be a Security Drone sent to search for Zeta by the enemy. If it is beamed successfully, then instead of searching for her, it will inform her of the whereabouts of her enemies. Action 2: Overload - This would be used to overcharge lights in a room, causing the bulbs to break and darken the room, providing opportunities for stealthy escape and mobility. Action 3: Electromagnetic Shield - A shield would be formed around the player, protecting them from any incoming projectiles for a predetermined duration. It should be noted that all of these abilities will have different stun duration, range, and so on. However, all of these variables will be fine-tuned and balanced later on during development in the second semester. Action 1: Allows the player to become slightly invisible and transparent. This makes the player difficult to spot by enemies. This effect only lasts for a limited duration. Action 2: The player may instantly transform into an inmate object within the surrounding area. The player will remain transformed up until they choose to perform a new ability or to move. In this form, enemies cannot detect the player. Action 3: The player may select a target NPC and instantly take their form. If the player has taken the form of a significant target and that significant target spots them, then all surrounding NPCs are alerted of the player. If a trivial target is selected, then the enemy detection range is significantly reduced. This effect only lasts for a limited duration. In regard to Action 2, it should be noted that the player will be transformed into a predetermined object depending on the environment that they are in and they would not be able to select the object themselves. This will hopefully make the process a bit smoother. I have also posted the prototype video showcasing the Camera, Movement, Teleport, and Flux. The User Interface in Altered Conduct is rather important, because it is a crucial part of the Special Ability Selection Process and the Changing of the Dice Roll. This is the main way players will be able to pick and choose which mechanics to implement in their solution, which is why it is vital that the UI provides and intuitive and easy to grasp experience. The specific and arguably most important element of the UI is the mechanism for choosing and changing the special powers, which is part of the HUD. This mechanism needs to elegantly connect three distinct categories of abilities, each composed of three elements, amounting to a total of nine elements. The easiest and most straightforward way of doing it would be to assign nine keyboard keys to each of the nine elements, however, that would demand that the players remember the functionality of more than half a roll worth of keyboard keys. That is why I went back to my research on Geometric Shapes, specifically the Platonic Solids, which all tessellate. As there are nine different actions, three from each category, it seemed natural to incorporate tessellated triangles into the HUD Design. The Special Ability Selection System, which is visualized below, works in the following manner. An equilateral triangle hosts the results from the three dice in dedicated spaces from its three vertices. These spaces are labelled A, B, and C for illustration and each can contain any one of the three possible abilities, depending on how the dice rolled. The ability which is located at the top of the triangle is automatically selected, ready to be used with the click of a keyboard button. If the player wishes to use a different ability other than the one at the top, they would need to press a Rotation Key, which will turn the pyramid counter-clockwise. After the rotation is complete the ability that used to be on the bottom-right vertex will now be selected. If the player wishes to activate an ability, they will need to press a Lock In Key. After an ability has been locked in, the three possible actions the player can do with it will be revealed in the spaces by the vertices. Using the same Rotation Key, the player could then rotate the pyramid to the desired option within the Category of that Ability. Once the player is happy with their selection, they wold need to press the Lock In Key and the chosen action will be executed. This system uses gives users access to nine separate mechanics by using only two keys. Please note, that all keys referred to in the designs below serve only as placeholders and the final keys used in the game will be determined after user testing sessions. In addition to selecting the desired ability, I have also designed a way to change the roll of the dice through this system. Before players have Locked In the automatically selected ability at the top vertex, they will have the option to change that ability. Pressing a Change Key would reveal the other possible options in the form of a wheel of tessellated triangles. Players would make the wheel turn by pressing the Change Key until it falls on the desired ability. Once they are happy with their selection, they would need to press the Lock In Key in order to solidify the change, and be returned to the pyramid of abilities. The gameplay and mechanics of Altered Conduct have been discussed in great detail so far, specifically some of the crucial game systems, the turn-based system, each of the special abilities, and how the user would interact with them via the UI. All of these elements have been lovingly put together in the slide show below, in order to illustrate how the game would play as a whole. The slide show consists of 18 separate images which go into great detail about each step of the process, including what changes occur for the player, the enemies, and the UI. It shows what players will do in this game and how they could play. In the example below, the player needs to move from Point A to Point B without being captured, which they successfully achieve by using three abilities within three player turns. It should be noted that the solution provided in the example below is not the only possible one to, but rather illustrates one of many options. Additionally, this specific scenario is based on a play-through from the Paper Prototype and it would take no more than a maximum of five minutes to solve. Hopefully, the sequence below will clarify how all the separate pieces fit together and provide a visual understanding of the overall structure and gameplay.